Raman spectroscopy is a compelling analytical tool for life scientists. Unfortunately, biochemical samples are typically highly fluorescent, fragile and rich in water. These attributes can significantly hamper Raman measurements – even to an extent where the intrinsically weak Raman signals are extremely difficult to detect. Timegated® PicoRaman technology offers a solution for tackling these challenges. Its effective fluorescence suppression in combination with a pulsed laser enables recording unprecedentedly detailed Raman spectra without damaging the samples by high laser energies. Applications in medicine, biology, biochemistry and pharmaceutical sciences have a great amount to gain from the Timegated technology. Raman spectroscopy has found its way to industrial laboratories and process analytical technologies (PAT) hence becoming a viable tool for a plethora of applications in the pharmaceutical sciences. Raman is a recognized means to analyze non-destructively solid and liquid formulations, phase transitions and polymorphs in all phases of drug discovery, development and large-scale production. Until now many Raman analyses have been confined by the high fluorescence of pharmaceutical samples. 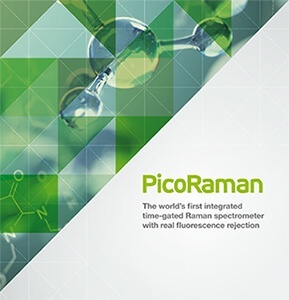 PicoRaman brings the benefits of Raman spectroscopy to a new level by rejecting the fluorescence and enabling a completely new window for the analyses. Protein- and macromolecule-based drugs (i.e. biopharmaceuticals or biologics) are manufactured using biological-expression entities such as bacterial, mammalian or insect cells. Such conditions impose a significant biochemical and productional complexity for controlling and quantifying the processes and ensuring the efficacy and safety of the macromolecule products. Raman spectroscopy overcomes many of these difficulties while being a non-contact, robust, insensitive to water, suitable for automation as well as a flexible measurement technique. PicoRaman’s time-resolved detection for fluorescence suppression, advanced pulsed laser and possibility to simultaneously determine the fluorescence lifetimes resolve the current limitations in the research and production of biopharmaceuticals. Useful structural and biochemical information can be extracted without the interference of water, with minimal sample preparation and without the use of labels by using Raman spectroscopy and microscopy. Cell research and microbiology are prominent areas which greatly benefit of these properties; mammalian and plant tissues, (fixed) cells in vitro and biofluids are examples wherein Raman is typically a powerful analytical tool. Timegate Instruments' new Raman technology also enables non-expert users to produce accurate, high-quality data for analyzing biological materials. With PicoRaman the measurements can be performed in ambient light, in physically and chemically varying environments and without the distraction of fluorescence background signals.